Rod Taylor is the voice of Pongo, the patriarch of the pups in this animated Disney classic. "One Hundred and One Dalmatians" opens with a bachelor -- Pongo -- lamenting his lonely life with his "pet" Roger, an equally lonely songwriter. Rod narrates the part with a soft, lovely, lilting English accent. Bachelorhood doesn't last long, however, as Pongo orchestrates a meeting in the park with lovely spotted Perdita and her "pet," Anita. After a wedding for the humans and a litter of 15 puppies for the Dalmatians, the evil Cruella de Vil enters the scene. Thwarted from buying the puppies, Cruella hires a couple of thugs to kidnap them. The story continues in her ramshackle country mansion, Hell Hall, where 99 puppies await a cruel fate -- being made into a spotted fur coat for Cruella. Pongo and Perdita run cross-country to rescue the pups, with the help of a clever cat and neighborly dogs. Walt had liked me in something, and personally called me to do "101 Dalmatians." I had forgotten all about it until it was re-released [in 1985]. Frankly, I've never even seen the film. But Walt was the sweetheart of all time. He and his people were so well-organized, it was unbelievable. They showed me rough cartoons before I recorded my lines, and I found it fascinating. I wish I had gotten to know him better. When it was released in 1961, it actually saved the Walt Disney company from bankruptcy. ... When making "101 Dalmatians," Walt Disney abandoned the time-consuming tradition of hand-tracing every "cell" and introduced a cheaper and faster animation technique, using a form of "Xeroxing" to mechanically transfer the cartoon drawings to film. That came in especially handy because the movie boasts more than 6.5 million "spots" on the Dalmatians, with doggy hero Pongo proudly sporting 72! The film also set the trend for Disney's recruiting of famous Hollywood actors to play the character's voices. In "101 Dalmatians," Australian Rod Taylor is the voice of Pongo. In recent times, Disney's celebrity voices have been a key to its animated smashes. Adding to the characters' credibility is an expertly-cast array of vocal talent. Actor Rod Taylor gave the character of Pongo its bite. ... [His] gentle but dynamic delivery brought Pongo to life. Rod Taylor is so dashing and classy as the voice of Pongo, you'd think you were listening to a director's cut of "The V.I.P.s." Pongo is such a contemplative, responsible character that it takes a certain kind of strong, but unadorned voice to pull it off. Taylor is perfect. 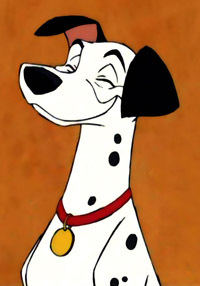 He also pulls off the paternal side of Pongo well, ordering around the scads of puppies like roly-poly little cadets.